These nutty-textured savoury crêpes are a French classic and are also ideal for pancake day. Make the batter by sifting the plain flour into a bowl, with a pinch of salt. Stir in the Malthouse flour then make a well in the centre. Pour in the egg. Add 225ml cold water and, using a balloon whisk, gradually incorporate it into the flour until you have a smooth batter, the consistency of single cream. Beat in the melted butter. Heat a 20cm heavy-based frying or crêpe pan over a medium heat then spray with a little oil (or dip a piece of kitchen paper into a little oil and carefully wipe over the hot pan). Fill a ladle with batter and pour it into the hot pan, tilting to spread evenly. Cook the crêpe until lightly browned underneath (about 1 minute), or until it comes away from the pan easily. Using a spatula, flip over and cook for a further 1-2 minutes. Repeat to make 4 crêpes, keeping them warm between layers of baking parchment. 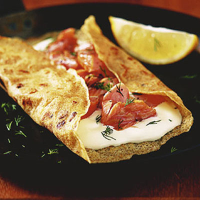 Serve each crêpe with crème fraîche, a handful of salmon flakes, dill, a little freshly ground black pepper and lemon wedges for squeezing. The crêpes can be made using all plain flour instead of 2 different varieties. They work equally well with sweet toppings such as lemon juice and sugar, or chocolate sauce. This recipe was first published in February 2006.